Cosmos DB provides a choice between 2 document API's: either the SQL API (previously known as DocumentDB API) or a MongoDB API. Hackolade supports both API's, with a separate plugin each. To perform data modeling for Cosmos DB with Hackolade, you must first download the Cosmos DB plugin. Note: the first time you run Reverse-Engineering for a plugin after download or update, the process takes longer than usual, as libraries need to be downloaded and installed. 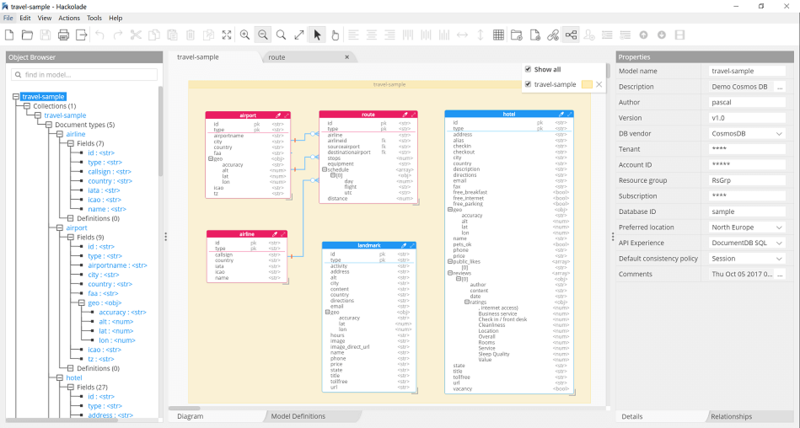 Hackolade was specially adapted to support the data modeling of multiple object types within one single collection - while supporting multiple collections as well - in order to support the pricing model of Cosmos DB. The application closely follows the terminology of the database. 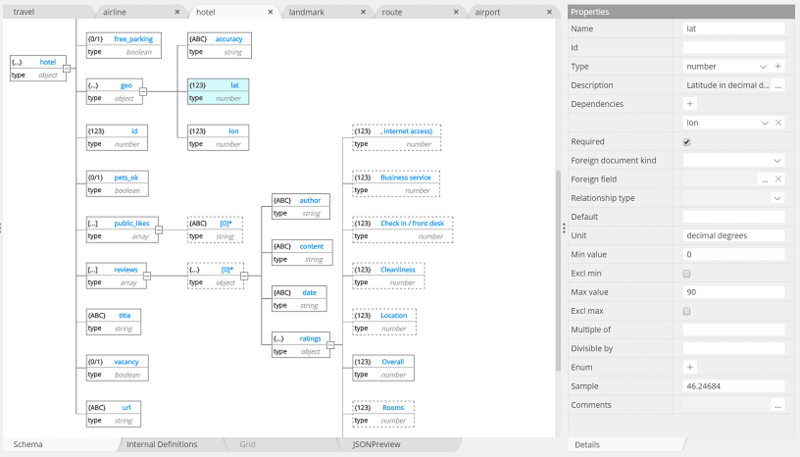 The data model in the picture below results from the reverse-engineering of a sample travel application imported in Cosmos DB. The id value is always required, and it must be unique across all other documents in the same collection. If left out out, then Cosmos DB would automatically generate one using a GUID or a Globally Unique Identifier. The id is always a string and it can't be a number, date, Boolean, or another object, and it can't be longer than 255 characters. Also, for any document committed to a collection, 5 system defined elements such as _rid, _ts, _self, _etag, and _attachments are automatically appended at the end of the document. The data types depend on the API chosen. Cosmos DB with Document API supports standard JSON data types, including arrays and objects. Cosmos DB with MongoDB API support BSON data types. The Hackolade menu items, contextual menus, toolbar icon tooltips, and documentation are adapted to Cosmos DB terminology and feature set. Hackolade was specially adapted to support the data types and attributes behavior of Cosmos DB. By default, all Azure Cosmos DB data is indexed. And while many customers are happy to let Azure Cosmos DB automatically handle all aspects of indexing, it also supports specifying a custom indexing policy for collections during creation. More information can be found here. Not applicable, as Cosmos DB does not provide any way to enforce any kind of schema. For the SQL API (previously known as DocumentDB API), the connection is established using a connection string including URI address and port (typically 443), and authentication using an account key. Click here for more details. For the MongoDB API, the connection is established using a host address and port (typically 10255), and authentication using a username and password. Click here for more info.